The final round of games in the 2012 EuroLeague Women regular season did not generate much excitement due to the fact that the 14 teams qualified for the play-offs were determined in round 13. The one highlight of the evening was the FIBA TV match between Fenerbahçe SK and Perfumerías Avenida because a defeat for Fenerbahçe SK would have seen them drop to second place in the ranking. In Group C, Sparta&K Moscow Region beat Lattes Montpellier (72-71) to secure the group win. However the teams that finished in second and fourth place in the group are ranked above them. Sparta&K Moscow Region are ranked sixth and will meet Russian rivals Nadezhda Orenburg in the play-off series. The complete eighth-final play-offs sets were determined by FIBA Europe. The star of the final evening of league play was Eva Vitecková from ZVVK USK Prague who helped herself to 35 points as her team crushed Lotos Gdynia (102-66). A number of players with slight knocks did not play this week as teams decided not to take too many risks. UMMC Ekaterinburg had an easy road win (85-45) against Seat Unisze Györ. However the 19-point performance from Candace Parker and the balanced scoring from UMMC did not cover up the problems UMMC are having. They missed Anete Jēkabsone-Zogota whose season is over with the confirmation of an ACL injury. Galatasaray MP were beaten at home by Ros Casares (98-80) in the only match from the group that had a bearing on final rankings. Maya Moore was on fire during the first quarter with 17 points. She finished with 28 points while Eshaya Murphy (Shay) added 20 points. For Galatasaray Diana Taurasi led the way with 28 points while Tina Charles and Epifaniya Prints added 23 and 21 points apiece. 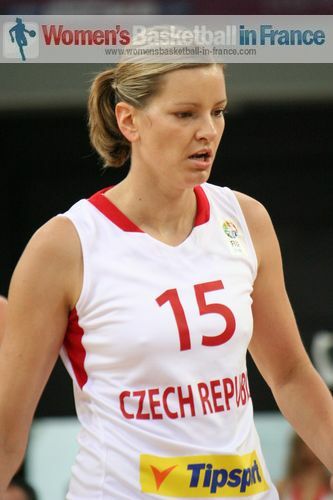 ZVVK USK Prague had an easy victory (102-66) against Lotos Gdynia with 35 points coming from Eva Vitecková (in picture). Bourges Basket also had an easy evening with a comfortable victory against VICI Aistes (78-49). Fenerbahçe SK gave a display in the art of fast breaks no matter who was on the court. They overturned Perfumerías Avenida (86-64). The damage was done in the first quarter with a 15-2 run to edge the first quarter. Ivana Matovic finished with 20 points for the Turkish side, that will now face Montpellier in the play-off series. Fenerbahçe SK are the only team from this season's EuroLeague Women to remain unbeaten. CCC Polkowice dug themselves into a big hole by trailing (5-23) after the first quarter to Nadezhda Orenburg . However the energetic Sharnee Zoll ran her heart out to bring her side to within 3 points at the the start of the final quarter (47-50). This was as close as the Russian side allowed the hosts to come back into the match as they finished with a flourish to win (71-58). Katie Douglas and Oxana Zakalyuzhnaya finished with 19 and 16 points respectively in the road win. Tarbes once again fell short and finish the EuroLeague season with a duck (0 victories) after losing (66-68) to Beretta-Famila. The Italian side did not play Cheryl Ford in this game. Marie Pierre Taupin who is the assistant coach at Tarbes acts as head coach until the club nominates a new coach. The final rankings from Group C is a perfect illustration of why winning the group is not important in the qualification system used by FIBA Europe. Sparta&K Moscow Region won the group with 11 wins and three defeats but find themselves ranked behind Wisla Can-Pack who finished second and behind Rivas Ecópolis who finished in fourth position. Sparta&K Moscow Region achieved the group win by snatching the victory against Lattes Montpellier (72-71) with the last score of the game by Seimone Augustus (22 points) with eight seconds to play. Ana Lelas' end-of-game buzzer shot missed the target for Montpellier. Edwige Lawson-Wade was again the top player for Montpellier with 19 points, 7 assists and 3 steals. Cras Basket beat Rivas Ecópolis (68-65) in a match with nothing at stake for either team. Whereas Wisla Can-Pack needed a big push from their fans to recover from a 5-point deficit in the final quarter to beat Gospic Croatia (74-71).